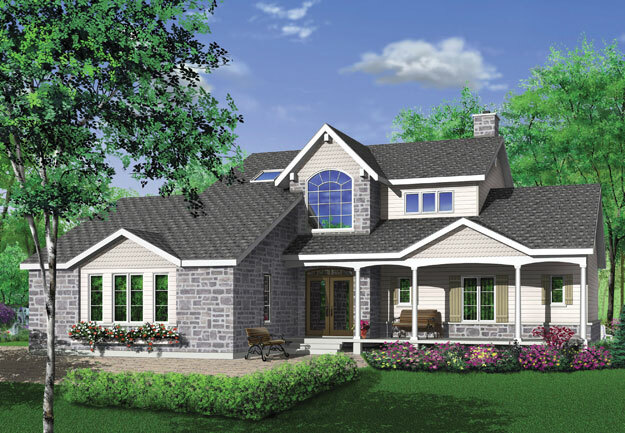 Escape to the abundant pleasures of this farmhouse plan. Enter through the covered front porch into the splendid two-story foyer with staircase and half bath. The family room features a warm, welcoming fireplace and adjoins the open-plan kitchen. You'll find plenty of cabinet space in the kitchen, along with the snack bar and eating area. The sunroom provides a pleasant retreat as well as access to the laundry room and two-car garage. The large master bedroom has a private bath with walk-in closet and separate doors to the rear patio. Upstairs, two other bedrooms and a den share the homeï¿½s second full bathroom, and the bonus room offers additional space to relax. Two upstairs balconies offer backyard vistas, and an outdoor staircase leads to the patio.